This is a 48 port managed Gigabit switch, and comes with a nice feature set. They are also cheap to find on eBay, and I paid about 60 euros including shipping for it. The switch still works as expected, and there have been firmware updates up until the beginning of 2015. When Nortel went under, the company was bought by Avaya, who has continued to make these switches (and their successors) to this day. I’ve bought this switch, because I want to build a small homelab to experiment with virtualization. The homelab will have at least three nodes, and my experience at Cyso teaches me that you probably want some kind of netwerk segregation between VMs, for instance using VLANs. The switch is quite loud. I expected this, because this is datacenter equipment, and datacenters don’t have to be quiet. 1U high devices also have small fans, and with a power draw of about 80W (according to some Reddit users), the fans have to rotate quite fast to move enough air. But that wasn’t the bad part. Some part of the switch was making a high-pitched noise. 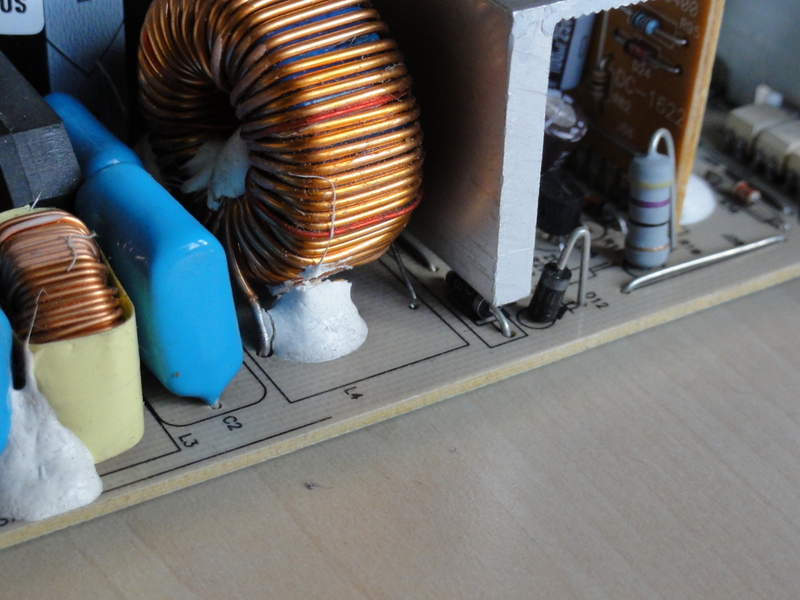 After some detective work to locate the source, I found that one of the transformer coils had a broken connection. 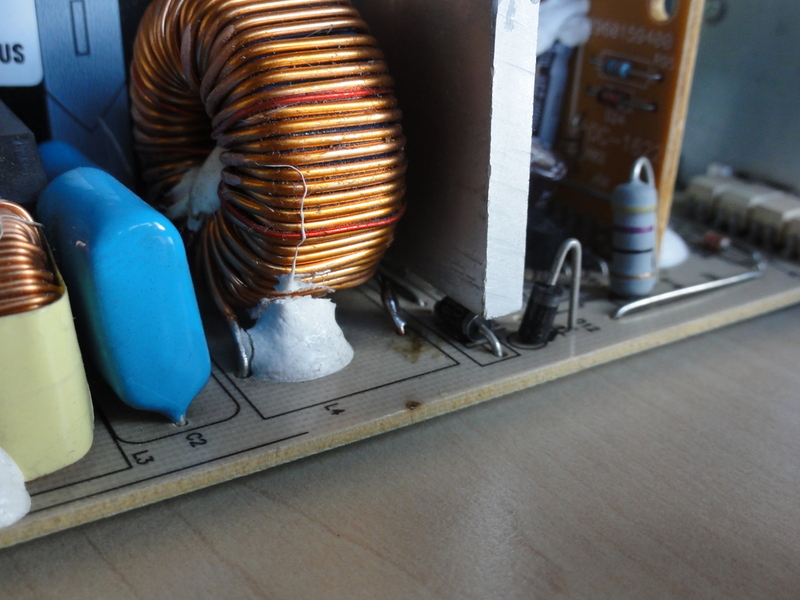 The glob of glue holding the coil to the PCB also had a big crack. I expect that this occurred sometime during shipment, because we all know how careful some postal services are. Moving the connection back in place with a bamboo knitting needle, the noise disappeared. 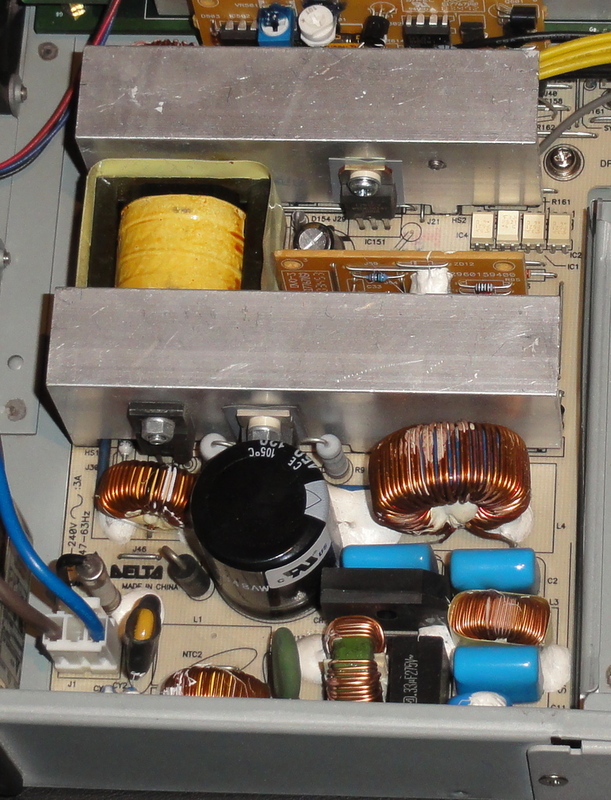 If you look closely, the right leg is not connected to the PCB. You can also see that the epoxy is cracked near the left leg. After powering on the switch, the annoying high-pitched noise was gone. That doesn’t mean the switch is quiet yet, but at least my ears no longer bleed with the switch turned on. All that’s left now is replacing the fans with low-noise alternatives. 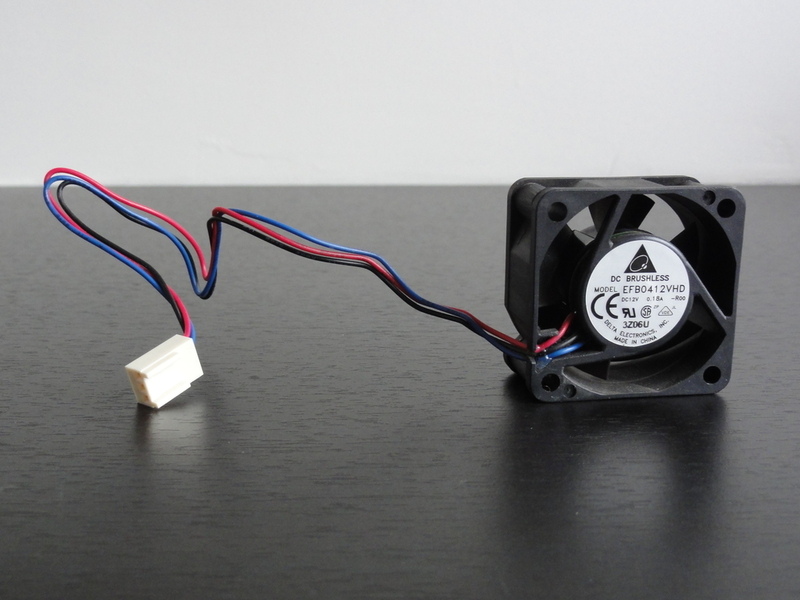 The stock fans are Delta Electronics EFB0412VHD-R00, which is a standard 40x40x20mm fan. It moves air at about 10.1 CFM or 17.16 m³/h according to the specs and is rated at 32.5 dB(A). An alternative could be the Scythe Mini Kaze Ultra, which moves 8 m³/h at 19.6 dB(A). Thats about four times as quiet as the stock fan. The only problem might be that they don’t move enough air. At least they’re not expensive on Amazon. Another alternative is simply disconnecting one or more fans, so the total sound volume decreases. Unfortunately, I cannot find the maximum operating temperature for the switch, so care must be taken that the temperature stays within an acceptable range. This is the solution I’m trying for now, maybe combined with some monitoring for the temperature. I can always buy new fans to replace the old ones. The temperature seems stable at 34.5 degrees Celsius when lying on a table, which doesn’t seem too bad. It runs at 29 degrees Celsius with four stock fans.